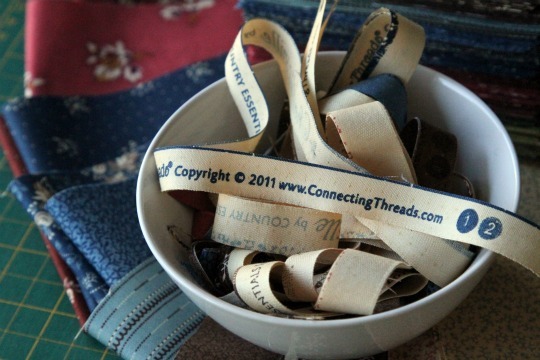 Connecting Threads may just be one of the best kept secrets in the quilting world. I rarely see it mentioned anywhere on the web and when I do, it’s usually people enticed by the prices who are afraid to purchase the fabric. The Vancouver, Washington based fabric company really seems too good to be true – the prices are mind blowing and it made me immediately question the quality. But after my mother (a long-time quilter) wholeheartedly recommended the fabric, I gave in and placed my first order. When you visit the Connecting Threads web site, you’ll immediately notice how well-designed the site is and how easy it is to navigate. Secondly, you’ll be shocked at the low prices. 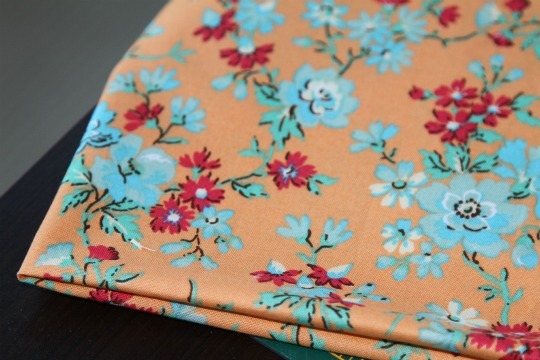 Basic solid colors are $4.96 per yard while designer prints are only $5.96. If you venture into the clearance section, you’ll find yards of fabric from $1.96 to $3.96 per yard. Connecting Threads ships outside the U.S. and for those of us in Canada, they collect 10% duty and drive items to the border. The packages to Canada are mailed from within the Canada Post system. Shipping for my order was only $7. Although low-cost shipping, I wished they offered expedited service to Canada, which they do not. So for now, we are at the mercy of the Canada Post … of which I’m not a huge fan. You’ll notice that Connecting Threads doesn’t carry the super popular designer fabrics found elsewhere. No Amy Butler, Joel Dewberry, or any of the Moda herd. Instead, the company designs and sells their own fabric creations. It took me a few minutes to get past not seeing all the trendy names. I felt a little snobbish, to be honest. But, once I looked beyond designer labels, I did find that fabric lines were on trend with other designer fabrics. And like designer fabrics, they designed fabrics into color families so you can easily color coordinate a project. The site also allows you to put fabric selections into a design table for viewing next to one another. If anything, some of the fabric lines seem a little ‘one-note’ with only a few color variances within a fabric line. For this reason, some of the fabric lines don’t seem as robust as designer lines found elsewhere. When my order arrived, I could hardly wait to crack open the box. I worried that my $80 order would result in less than wonderful fabric. As soon as the fabric slipped between my fingers, I was hooked. The fabric has the same richness and thick feel as any Moda fabric. The colors are also rich and designs precisely printed. I’ve begun sewing the fabrics and they zip happily through my machine. Although I haven’t yet washed the fabric, I’ve been told that it washes extremely well (no color running, minimal shrinkage). Once I complete my first project using the Connecting Threads fabric, I’ll update this post to include any additional thoughts. I should note that the company seems to cut fabrics ‘exact’, however I’ve found them to be generous in some cases. Of the three half-yard cuts I ordered, one measured exactly 18″, one measured 23″, and one measured 56″. The two with longer measurements were clearance fabrics, so likely near end of bolt and they just threw in the extra. As for now, I’d love to place another order. There are about 300 fabrics currently in the end of year clearance section so it’s tempting to load up. I already have several projects lined up and keep telling myself that I can’t buy (or find storage) for any more fabric until I get these projects finished. 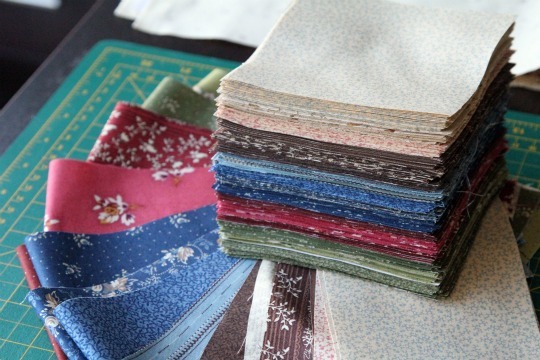 Have you used Connecting Threads fabric for your projects — what are your thoughts? I created a Flickr pool for sharing Connecting Threads projects — join and post your photos! Nice review of their fabrics. Have you tried their cotton thread? I’ve read a few reviews on it and most say they are very linty. I currently use Aurifil which has little lint, but it’s pricey! I do like the value of the Connecting Threads thread. I’ve ordered from Connecting Threads and couldn’t have been more satisfied with the experience. The fabric was lovely and the customer service people there are AMAZING. I had to make a return because I wasn’t happy with a color I chose and the woman I spoke with spent time with me on the phone discussing the colors, what I wanted, making recommendations, and generally being extremely polite. That’s a lot more than I can say for any of the other major online fabric retailers I’ve dealt with. Ritchie: Currently, I use Gutermann thread. I haven’t tried the Connecting Threads thread yet but my mom sent me a care package recently that included one of their huge cones. I plan to use it on an upcoming projects and will post a review once I’ve tried it. The price certainly makes it tempting. Regina: Great to hear their customer service is good too! Thank you for your review! My friend pointed me toward their site for great deals on cotton thread sets, and I found some fabrics I liked in the clearance section, but I was also plagued by questioning the quality due to low price. You’ve put my mind at ease and I will be placing an order with them now – thank you again! Junebug: Let me know what you think — I hope you like it as much as I do! Am Canadian. Love to sew. Have ordered from Connecting Threads and love their material. Have purchased thread and batting etc. Would highly recommend them. Unbelievably priced and they are excellent to deal with. I order on line and they email when the order is received, when it’s shipped and when it’s in the Canadian postal system and the tracking number. They are amazing. Have placed several orders with CT. Also like their thread. Their 30’s are fabulous—all on fresh snow white background. Also ordered the civil war line as did you….and will probably order more…right now I am drooling over the new Prairie Sweetgrass….their solids are marvelous and go on sale too….they are the best kept secret FOR SURE. (Customer service also excellent, also offer gift certificates which I have asked for for Christmas) I buy Moda charm packs for a treat but most of my stuff is from Ct! Do you pay alot of duty when you order from Canada? just received my first order & was pleasantly surprised, the fabric was as good as any I have purchased, I to was looking for the big names & questioning quality. Will be going back for a return visit. I agree, their website is AMAZING. I always shoped at Joann and like their fabric,threads,and batting.Connecting Threads quality is the same,but about half the cost.Love the free shipping offer,that mean I get even more for my money. I just received my first fabric order from Connecting Threads. The ordering was easy, fabrics are very nice, great colors and my order arrived in a timely manner. My only issue is the heavy chemical smell in the fabric. As I type this the fabric is washing. I will let you know how that goes. Other than that Connecting Threads was a great experience. I washed the Connecting Threads fabric, added one cup of white vinegar to the rinse. Hung the cloth on the clothesline overnight. The next day the fabric smelled great. No formaldehyde smell and the fabric had a nice hand.